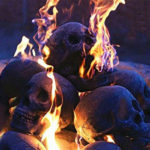 The classic way to decorate your fireplace mantel for the New Year is to display the numerals of the new year. Depending on your point of view, that means each year you “have to” or you “get to” buy a new banner. 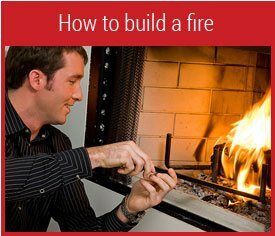 Want a short-cut way to make your own New Year Fireplace Banner with the year? These twenty sturdy cut-outs , below, of the year’s number each measure 7 inches wide and 5 inches tall. The glitter looks like sparkly glitter. But it is actually printed on the cards, so it won’t flake off onto your hearth or rug. 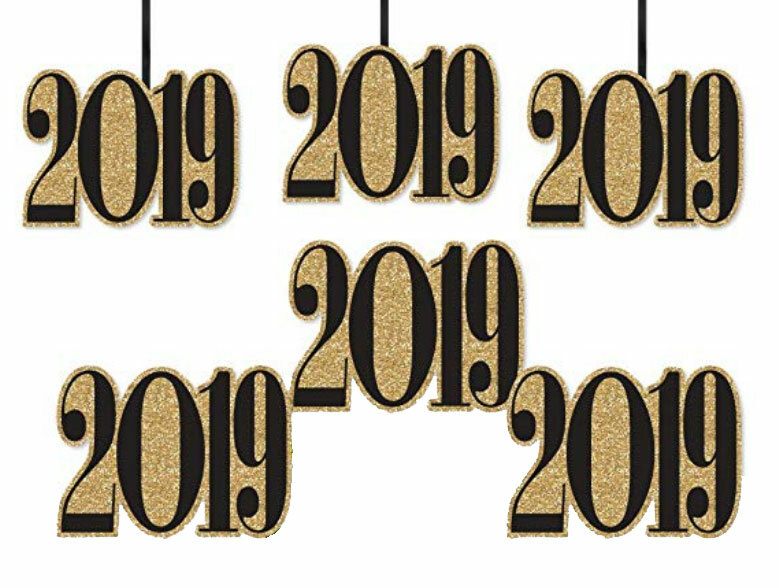 Simply hang or string these on a ribbon of your choice for a great fireplace banner to welcome the new year. These 8-inch tall gold glitter numerals are three-dimensional, so they add extra depth and interest to your fireplace. The glitter is treated to make it low-shed. Each number is 1 1/4 inch deep. 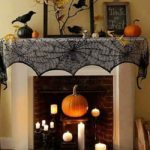 So you can sit them on the mantel or string them together to create a garland. 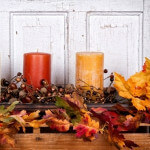 If you prefer to attach the numbers to the mantel, we suggest removable Command hooks. 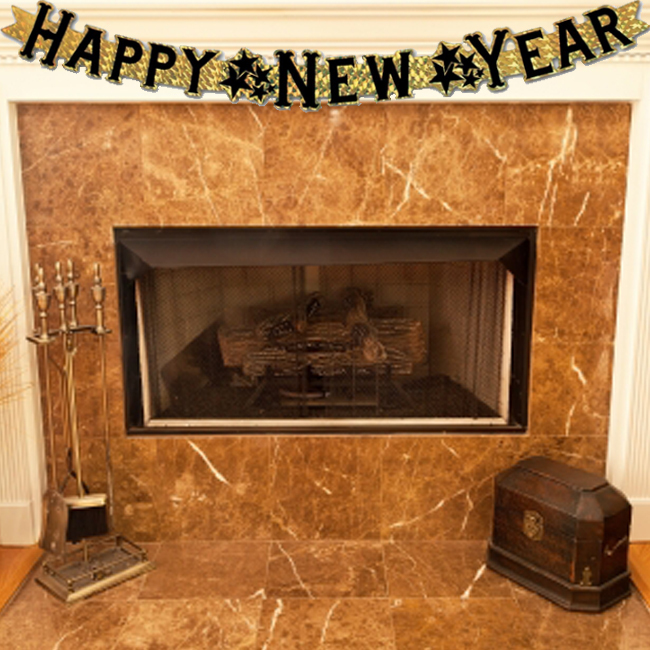 Go straight to the message with a fireplace mantel banner or garland with those three magic words for January 1st: Happy New Year! 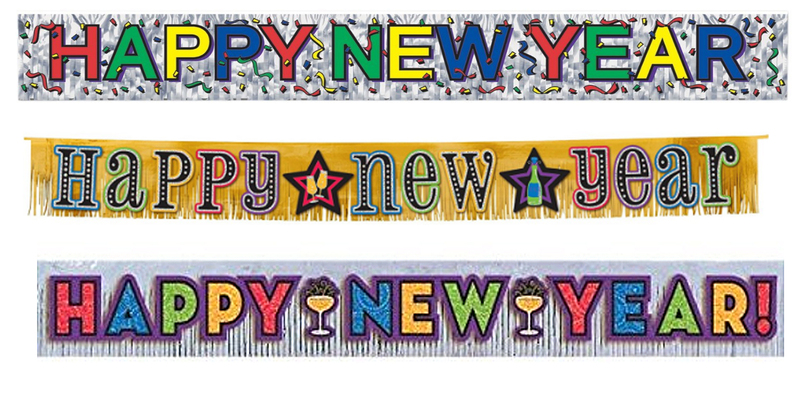 With large, 8 1/2 inch by 8 1/2 inch letters, the Beistle Happy New Year Streamers are a great size. 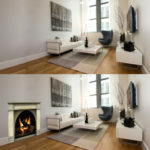 The letters can be spread out more if you are using them with especially large fireplaces. The Beistle Streamers come in sparkly Gold and Black, Silver and Black, and Multi-Color. 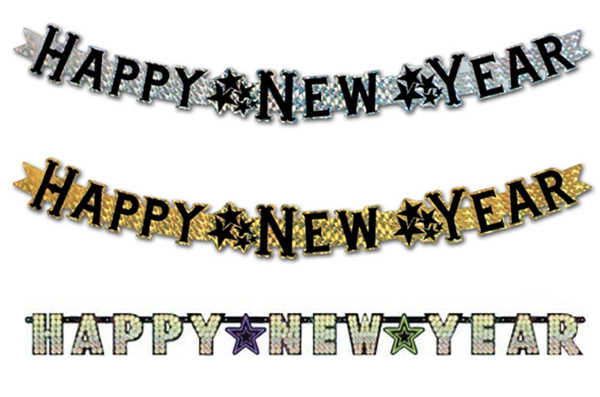 The Beistle Sparkle New Year Streamers come in Gold and Black, Silver and Black, or Multi-Color. Prismatic New Years fireplace banners give the illusion of 3-D prisms and are designed to reflect light from the fireplace and the room. 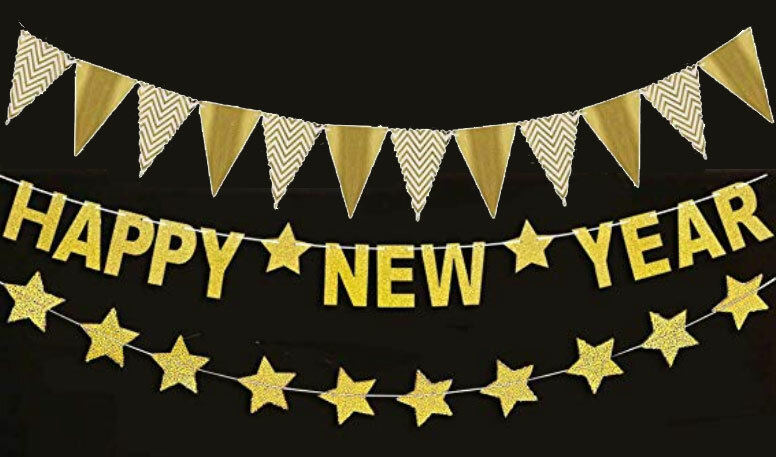 They come in Silver and Black or Gold and Black Banners as well as a New Year Individual Letters Streamer with Prismatic Dots. These New Year fireplace banners below have one letter on each pennant – whether the pennant is a triangle, square or circle. Triangle, square, and circular individual letter New Years banners. 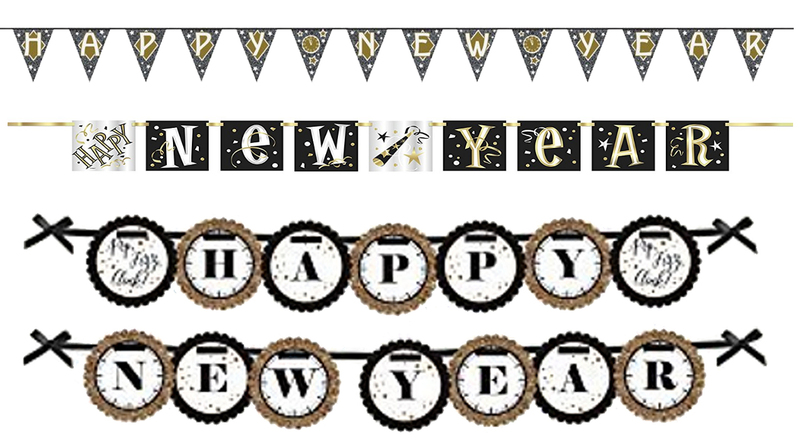 Jointed or hinged Happy New Year fireplace banners are another option. 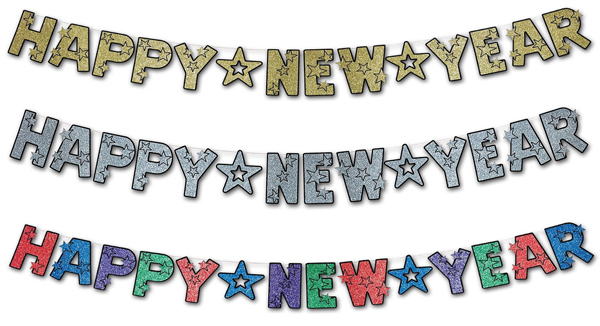 Hinged Happy New Year Fireplace Banners come in a 5 foot long Silver and Black or in a 4 foot long Multi-Colors. Foil fringe New Year banners work well over a lit fireplace because the waves of rising heat will gently flutter the fringe! Foil Fringed New Year Fireplace Banners flutter as the heat rises from the fireplace. Reuse them next year by just taking off the pennants with the year. 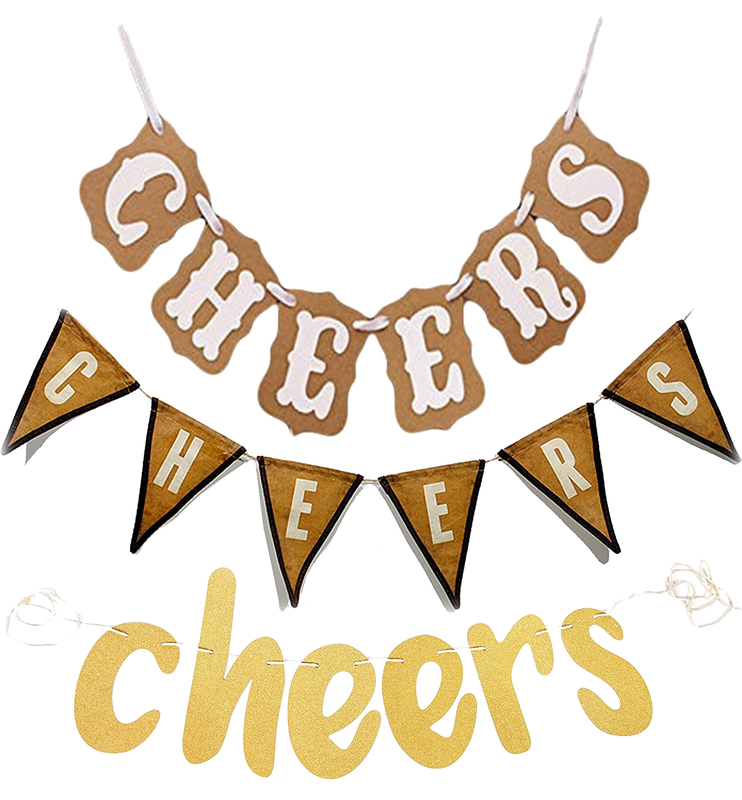 Banners that say “Cheers” are versatile. Use these for New Year’s and encourage a toast. You can also display them for weddings, anniversaries, graduations, and promotion parties. No matter which option you select to welcome the New Year, whether banners or pennants on the fireplace mantel with the new year’s numerals, the words Happy New Year, or the single word Cheers, have a happy and safe New Year’s Eve. 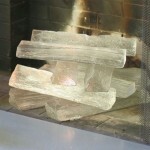 Also, see more ideas for New Year’s Mantel Decorations. 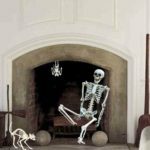 Last updated by Susan at December 1, 2018 .